Whether you have a damaged ceiling that needs repairing, or if you are looking at getting a new ceiling for a room in your house, we can help. Why not contact me today for a chat and to get a competitive quotation for your ceiling? Whether for new build houses, extensions or for room rebuilds, many people have a need for ceiling installers. 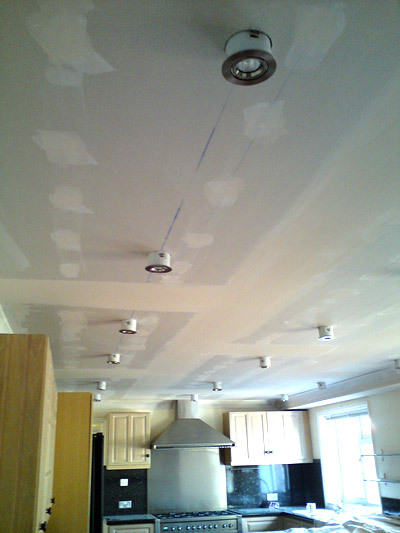 This is where I can help, offering experienced advice for your project, as well as skilled ceiling installation. With plasterboard, plastering and sometimes artexing, I have many years experience with all types of new ceilings and understand the many issues that come to ensure that your project runs smoothly. Ceiling Plasterboarding onto roof boards or joists. New ceilings for all sizes and shapes of rooms. Whether through age or accident, I help people with ceiling repairs in Hampshire, for family homes and commercial properties including office ceiling repairs and shops. This includes repairing ceilings from water damage and accidental damage. When you invite me into your home for a new ceiling installation or ceiling repair, I make sure that I am quick and efficient to minimise disruption. Although ceiling repairs and can sometimes be messy, I also make sure that I keep your house and your possessions from being affected and I always tidy up afterwards.